When Christian was preparing to head to college two years ago, he was also preparing for a car-free commute. Today, Christian leaves the car keys at home and let’s Metro (and Madison County Transit) do the driving for him. To get to and from class at Southwestern Illinois College (SWIC), Christian boards Madison County Transit’s #5 Tri-City Regional bus near his home and rides to the Emerson Park MetroLink Station. From there, it’s a quick trip on board a Red Line MetroLink train to the College MetroLink Station and SWIC. 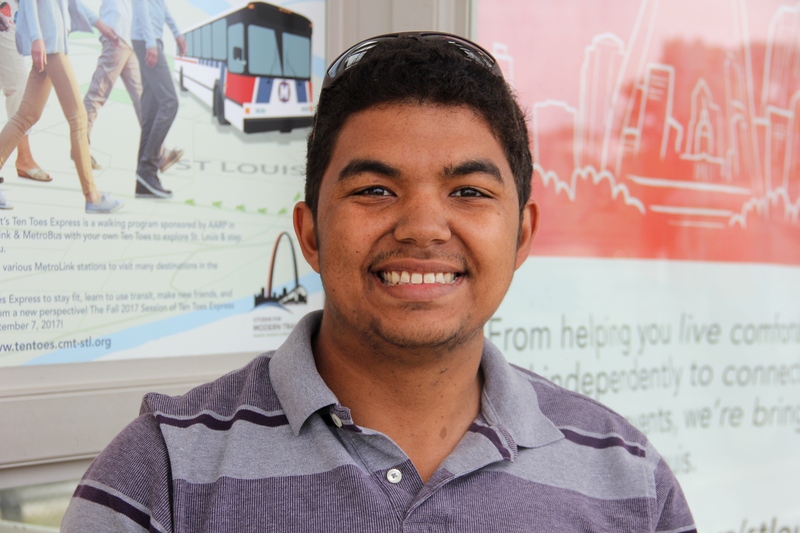 In addition to his school commute, Christian also uses a combination of Madison County Transit and Metro to get to work as well. “It’s a lot cheaper,” he said. While public transportation is cost-effective, Christian also chooses transit for its reliability. “It provides me with a guaranteed way around town, wherever I need to go,” he said. Christian said it was fairly easy for him to learn how to navigate between the two transit systems — you just need the right tools. “I made sure I was familiar with both websites — and used maps,” he said.